I was lucky enough to receive a copy of Claire Cook's Seven Year Switch to review recently, and I really do mean lucky! Anyway, Seven Year Switch was fantastic. I read it in under 48 hours. I couldn't put it down. Jill was great. I loved her. She was strong, powerful and an incredible mother. I wanted to be her friend. I wanted to empower her. And I sometimes wanted to give her a swift kick where the sun don't shine. But most of all I really liked her. The relationship between Jill and her ten-year-old daughter was well developed, and when Jill's ex returned to step into their lives, I loved how she initially responded. But then I truly loved how she opened herself up for her daughter's sake. It was real, and helped me know her better. Claire Cook put some twists in that were slightly surprising, although somewhat predictable as the story progressed. I enjoyed watching Jill develop as her relationship with Billy developed, and her strange friendships with Cynthia, and even Joni (her boss). 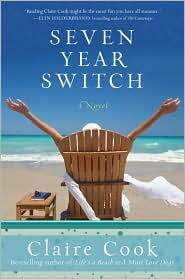 Seven Year Switch is a great beach read, from start to finish you'll enjoy this story, 100%! I read this and completely forgot to write up a review. I enjoyed it as well (shocking, I know :))and was pleased with the ending...although I got worried there for a minute. I enjoy Claire Cook. She's light and easy to read. This was the book I was looking for when I read the Sweet Potato Queens. I just finished Dorothea Benton Frank's newest and enjoyed that as well. Thanks so much for the great review, Andrea! I'm so glad you enjoyed SEVEN YEAR SWITCH and I've really enjoyed connecting with you and visiting your blog! Good Girl Gone Redneck is such a fabulous name! Thanks for your kind words, Sorta Southern Single Mom, and I'll keep an eye out for a review in Single Mom in the South! Thanks again and write on! Go to http://ClaireCook.com to win a beach bag filled with all 7 of my novels, plus a beach towel!! Good to know, always looking for books!